The symposium was created and developed to recognize Marine Lieutenant Colonel Jimmie Dyess's courage as both a citizen and a soldier of the United States and to identify others who have shown similar valor or made civic contributions above and beyond the call of duty. The symposium includes talks by several distinguished individuals, including the yearly recipients of the Jimmie Dyess Distinguished American Award. Please consider making a tax-deductable contribution to the Augusta Museum of History to insure this event will continue for years to come. I. 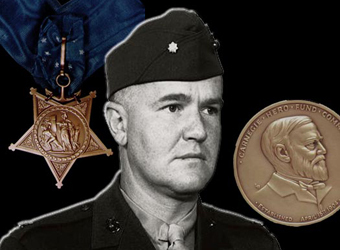 To preserve and enhance the legacy of Marine Lieutenant Colonel Jimmie Dyess, the only person to have received America's two highest awards for heroism, the Medal of Honor and the Carnegie Medal. II. To salute outstanding Americans who, over a lifetime, have made major contributions to their nation, their community and their fellow citizens. In 2019, Medal of Honor Recipient Melvin Morris, William S. "Billy" Morris III, and Jane Howington will receive the Symposium's Distinguished American Award. III. To support the Congressional Medal of Honor Foundation by drawing widespread attention to its mission of perpetuating the Medal of Honor's legacy through outreach and collaborate efforts. IV. To highlight the Carnegie Hero Fund Commission and to give visibility to those who have received America's highest award for civilian heroism, the Carnegie Medal. V. To welcome people from all over America who visit Augusta to attend this symposium and to meet and visit with the honorees. VI. To lend public and financial support for the Augusta Museum of History. In this award-winning museum is a permanent exhibit which honors Jimmie Dyess. The large crystal exhibit of the Dyess Symposium is on permanent display at the museum. It features the three awards that Dyess received: the Medal of Honor, the Carnegie Medal and the Eagle Scout Award.